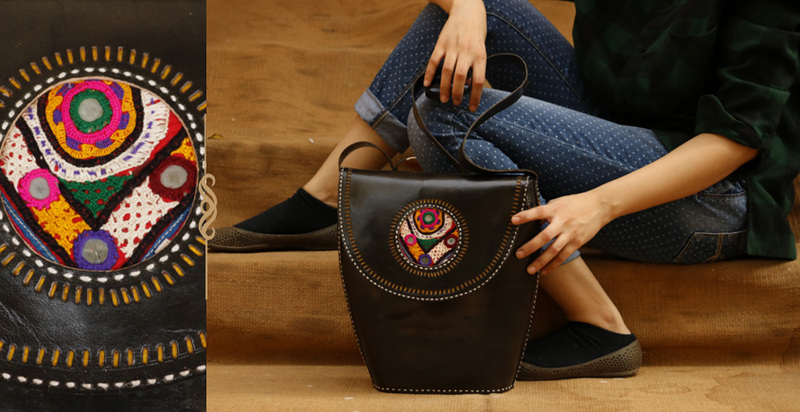 About Product : When flamboyant diversity of kutch meets contemporary utility, these leather bags get crafted in energetic colors... handcrafted in varied shapes and sizes, each carries a subtle uniqueness of its own. Fineness in its make, the line of hearts punched on its belt, a small pocket for extra change just in reach and volumes of space to carry your thoughts.... independent! Wrinkled brown, sturdy leather, like the cracked parched expanses of the Rann, dotted with multicoloured droplets as if sun tanned skin is punctuated with tribal tattoos. Earlier a collaborative outcome of the Maldhari nomads’ tanning expertise and the Meghwal community’s stitching and embroidering skills, the Kutch leather craft is now a means of business and livelihood for many villages in Kutch, Gujarat. The leather craft was traditionally used to make harnesses for camels and horses, musical instruments, storage containers and footwear. 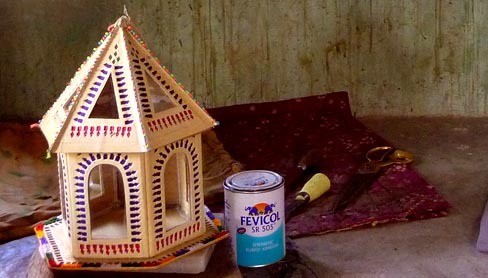 Today, this craft is an important supplement to the income from farming, for communities in Hodka, Bhirandiyaro, Dhordo, Sumarasar, and many other villages in Kutch. 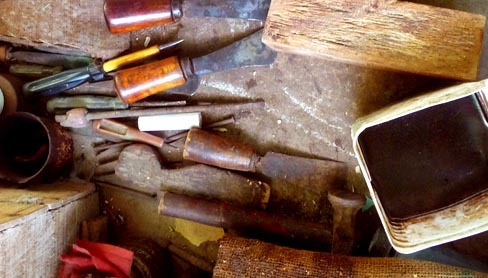 Craftsmen make objects of modern utility, such as mobile covers, bags, stationery and lamp shades. 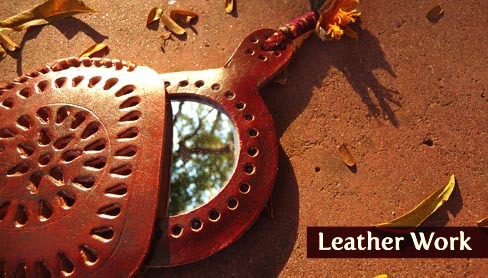 The city of Bhuj serves as the raw material sourcing hub for Kutch leather and embroidery crafts. 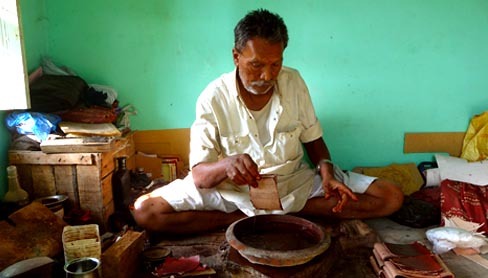 From leather and its dyes, to threads and tassels, or phunkas to decorate, all is sourced from Bhuj. Punches of all kinds are brought from Ahmedabad. The craftsmen either leave the leather in its natural colour, or dye it with strainers in shades or brown, or sometimes even bright colours like yellows, blues and reds. 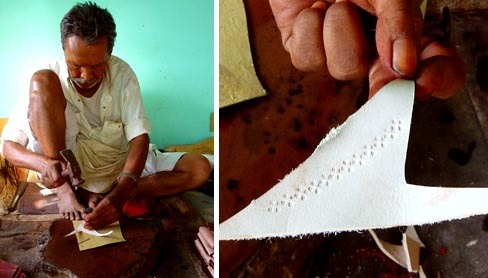 Using punches of a range of shapes and sizes; from geometrics like circles, triangles, squares, ovals and rectangles, to shapes like leaf, heart, moon and stars, the craftsmen make holes in the leather for a reverse appliqué like technique. With carefully composed, concentric or linear geometrical patterns, they play with colours as they place fabric pieces in bright hues under punched holes in leather. Rubber glue sticks the fabric bits with leather and then a backing is given to the composition, usually with colourful block printed cotton which is also handmade in Kutch. Working with simple punches ad hammers, an amazing variety of geometric patterns are created by the craftsmen, giving the surface a playful, vibrant character, not generally associated with the ruggedness of thick leather. With a little less pressure on the same punches, sometimes the craftsmen just give a low relief to the surface, for textured patterns. As the leather weathers, the punch engraved relief area becomes darker and appears like the tattoos that adorn the people of Kutch. It is one of the many instances where expressions of beliefs and expressions for livelihood merge at the juncture of creativity. The pieces of leather are hand stitched by passing thick thread through small slits made with a stitching awl. Craftsmen have also started using sewing machines to assemble the pieces together, thereby adding efficiency to the traditional craft. While the men are involved in the processes of cutting, punching, shaping and joining of the leather pieces, the women add the necessary colourful embellishment to the leather with embroidery in contrasting coloured threads. Golden and silver thread stitches and mirror work adds a touch of sparkle and multicoloured thread tassels make the piece irresistibly charming. With changing times, many craftsmen are switching to rexine, or artificial leather to practice their craft on. Be it rexine or leather, punched or embossed, the village craft of leather work moulds itself to any purpose, for any place. Just a few tools, some cloth and plenty of imagination, are all that is needed to create new and beautiful things from an age old tradition.